At the end of last week, I received the EOB (Explanation of Benefits) from my medical plan for my appendectomy hospital stay in September. Immediately, my eyes moved to the overall cost of my stay in the hospital, the surgery, the intensive care, the drugs. This included various details, all laid out in my form, including $880 per day for five days’ stay in the hospital, $2,681 to cover services in the intensive care unit my first night, $7,437 in operating room expenses, $2,278 in pharmacy costs, plus nearly $9,000 in various other costs. As I said at the beginning, there are many questions racing through my mind. I can’t stop thinking about this. How do they come up with specific pricing? Why break out the costs into so many different categories? As always, why are the pharmacy costs nearly ten percent of the bill? Fortunately for me, I’m enrolled in a fairly generous medical benefit plan through my employer. This plan means that my cost for this stay will be something just short of about ten percent of that bill. Still very high, especially for someone who already spends a few thousand out of pocket for drugs, supplies, and doctor visits throughout the year. Which brings me to these very important questions: What does someone do if they are not in an employment position as advantageous as mine? In other words, what does someone do without coverage, or without adequate coverage? If it’s early in the year and you’re under a high deductible plan, and you get a big fat statement like this one, how do you pay for it? Don’t forget, acute appendicitis isn’t something that anyone plans for. Neither is diabetes. Simply reviewing my situation, it’s easy to see why families declare bankruptcy every day due to medical expenses beyond their control. And now, the U.S. Congress wants to allow states, through the Affordable Care Act, to sell skimpy policies to so-called healthy people. For a moment, let’s put aside the fact that this would mean huge increases in rates for the insurance options available for People With Diabetes. Instead, since this is a diabetes blog, let’s look at it from the standpoint of initial diagnosis. Let’s say it’s early in the year, maybe February, and someone covered under one of these skimpy plans is diagnosed with Type 1 diabetes, requiring insulin every day, plus the durable medical supplies, test strips, insulin needles or pump paraphernalia, that go with it. The good news is that the plans being talked about for this kind of individual cover a lot of the cost of “catastrophic” care. The bad news is, the insurance company decides the meaning of the word “catastrophic”. Even if they cover the cost of a short hospital stay due to DKA or something else just as serious, they’re not going to cover any of the continuing costs of regular daily diabetes maintenance. And, as we all know, daily diabetes maintenance is anything but regular. So, our previously healthy person is now stuck with what could be overwhelming costs, and over ten months left on a medical plan that won’t pay for hardly any of it. That’s just a diabetes diagnosis. What about something like a stage 4 cancer diagnosis, a heart bypass, or another condition? What does coverage (or non-coverage) for those look like? Oh, I have many questions racing through my head today. And an incredible feeling of gratitude that I am one of the lucky few who can afford what just happened to me. Friends for Life Falls Church. Like the Energizer bunny, Friends for Life just keeps going. I think Children With Diabetes, the organization that stages the Friends for Life conferences throughout the USA, and in the UK too (and occasionally Canada), would rather be thought of on their own, as opposed to being associated with a battery company. But that aside, after attending many of these now, I am still amazed at how they make each gathering spectacular and unique. 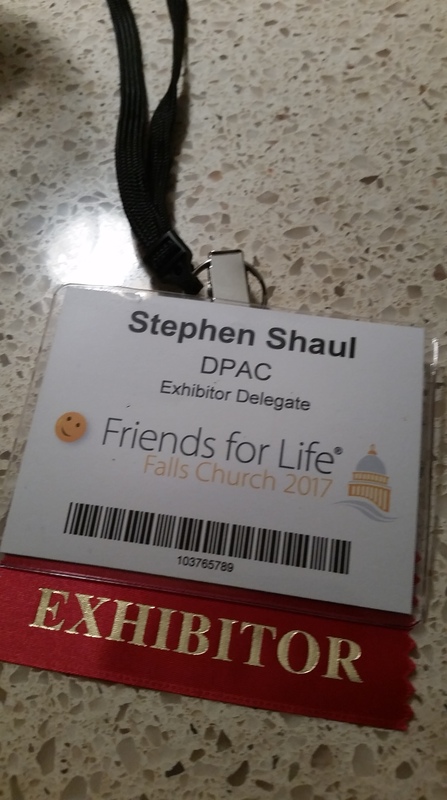 In Falls Church, Virginia last week, I was working the DPAC table in the exhibit space again, like I’ve been doing for a while now. That means I don’t get to get into many sessions, but I do get to see a lot that goes on around the venue. Not backstage pass kind of stuff, but things that I think help me see how much of an undertaking each conference really is. The first thing I noticed was the update to the sessions in the schedule. More advocacy sessions with Christel Marchand Aprigliano and Stewart Perry. Cynthia Rice from JDRF and Paul Madden from ADA also jumped in here and there. Also, there were sessions about Succeeding as and Adult and Parenting with Type 1, a Safe Zone discussion for Significant Others of adults with T1D, and two sessions for Grandparents and Occasional Caregivers. I saw a session on Your Legal Rights as a Person With Diabetes. When you’re tackling these subjects, led by smart people like Kerri Sparling, Tamara and Sean Oser, Brian Grant, and Leigh Davis Fickling, you know you’re going to learn something significant without needing a PhD to understand the subject matter. Unlike some of the other FFL events I’ve been to, this time I was able to see a lot of the staff working in the background to keep things running smoothly. Think about everything that needs to be done: Making sure everything arrives (think T-shirts, badges, and those wonderful green bracelets). Setup and registration. Getting rooms ready with the right amount of tables and chairs, screens to view presentations, and branding material. Coordinating meals and food choices with hotel staff. That doesn’t even count little extra touches that mean a lot. When someone at registration asked me if I had diabetes (do I get a green bracelet? YES! ), then someone else asked, “Do you still have an appendix?”, it was the funniest moment of the entire weekend. I don’t know how they all remember so much. I’m not kidding… everyone works so hard, yet makes it look so effortless. Many of the first timers I met, from Ohio and North Carolina and Pennsylvania and beyond, really appreciated how they were made to feel at home, and how accessible everyone was. How can I describe it? Friends for Life is a comfortable place where everyone feels like they belong. It’s a conference, while redefining the very meaning of that word. Friends for Life is an experience, not one time, but always. Extra: You should definitely read this post by Leigh Fickling over at Six Until Me. This describes FFL maybe better than anything you’ve read above. **Note: I get nothing for writing about Friends for Life. DPAC paid for my travel and accommodations to Falls Church, Virginia. Opinions on Friends for Life are entirely my own.